"Assignment No. 2," by Nigel Poor and Michael Nelson. Nigel Poor, Michael Nelson, and Lisa Sutcliffe speaking with Lake Effect's Mitch Teich. A unique group of people is coming together to examine criminal justice reform in a novel way. The Milwaukee Model is a symposium organized by the Milwaukee Art Museum and the Haggerty Museum of Art. The goal is to explore how arts and education programming can play a role in changing attitudes toward prison, prisoners, and criminal justice. "In life, there's been a lot of different experiences and opportunities that I've been faced with where there was a deep sense of void." The symposium is taking place at the same time an exhibit at the Milwaukee Art Museum poses similar questions about prisons and the people who inhabit them. 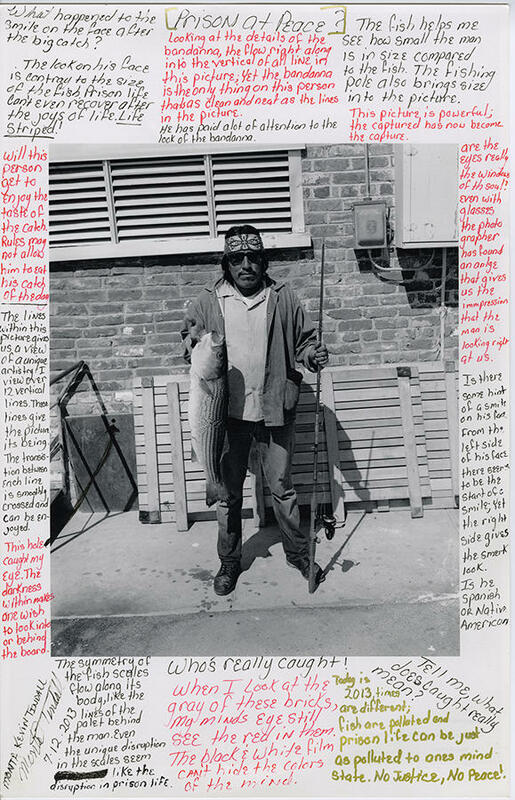 The exhibit, "The San Quentin Project: Nigel Poor and the Men of San Quentin Prison," features photographs taken by prison employees, which document life inside the walls of California's San Quentin prison. Nigel Poor is the artist behind the exhibit, and she's also an artistic collaborator with Michael Nelson. The two met while Poor was teaching a class at San Quentin and while Nelson was incarcerated for Murder. They created the project, "Assignment No. 2," a response to two artistic photographs of empty movie theaters, which Nelson started while in solitary confinement. He explains, "Images stand alone in their own way, and in that present, physical space, I definitely felt alone. And then in life, there's been a lot of different experiences and opportunities that I've been faced with where there was a deep sense of void." Lisa Sutcliffe, the Herzfeld Curator of Photography at the Milwaukee Art Museum, is responsible for bringing the exhibition to Milwaukee and curated it. She hopes the exhibit, and the symposium, will be an opportunity for people to ask questions about our prison population, and engage with a community that she says is, "invisible, for the most part." Sutcliffe says, "I've been thinking about how we can make exhibitions that are a platform for conversations about issues that are relevant to us. So I really wanted to bring this exhibition to Milwaukee, to think about what Nigel's done at San Quentin and how we can think about these issues here in Milwaukee." The Milwaukee Model Symposium artist-led talks and discussion are Friday, November 2 through, with a a Community Day of Action on Saturday. "The San Quentin Project: Nigel Poor and the Men of San Quentin Prison," is on display at the Milwaukee Art Museum through March 10. The new production Against the Grain: The Life and Times of Levi Fisher Ames tells a lesser-known Wisconsin story about a Civil War veteran who found a creative way of dealing with post-war trauma.